An RSS feed (or news feed) is a means by which you can stay informed about what's going on at Greeley Harmonix without having to regularly visit the website. We are a group of women with diverse backgrounds and a passion for singing a cappella harmony. We rehearse in a fast-paced, enriching environment and we invite all women singers to join us! 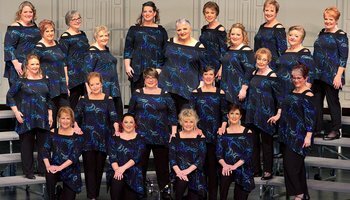 Yes, we are Sweet Adelines, too! Greeley Harmonix rehearses every Monday from 6:30 p.m. - 9:00 p.m.
We want you singing on the risers with us! You're going to love it! We encourage guests to arrive at least 10 minutes early for introductions. If you are interested in joining our chorus, our music director Julie Palagi will assess your voice to determine what part fits you best. We then give you music and access to learning tracks to learn the audition song. Knowing how to read music is not required. Want Greeley Harmonix to sing at your next function? Why not hire Greeley Harmonix to entertain at your next event? We can perform at corporate functions, charity events, community Entertainment events, birthday parties, christmas parties, awards nights, weddings, engagements, anniversaries, engagements, and even funerals and memorial services.